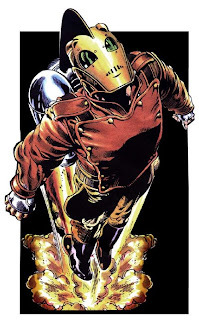 Very sad day, artist Dave Stevens (Rocketeer and many other comics) has passed away after battling leukemia (semi-privately) for the last few years. Any fan of Bettie Page had to have been a fan of Dave Stevens. I met him through his ex-wife Brinke Stevens (I did work for her back in the early 90s) at a Comic Con waaay back and had him sign a copy of the Rocketeer. Brinke was the model for most of his Bettie Page artwork and Dave's Rocketeer was based on his and Brinke's relationship. I didn't know him personally but have to thank Brinke for showing me his fantastic art and making me a fan.